I could be happy only if I get that job I applied for or if I get more followers on my blog or if I lived in another life would be so much better or if I could only find that one perfect person. Truth is getting what you want might bring you momentary joy, but if you can’t find the happiness you seek in your current situation no matter what comes your way you will sabotage it. To change these habits there are a few things that we need to accept. Embracing Change: There is a saying that the only two things in life that is certain is death and taxes. Change should be added to the list. Nothing stays the same. Everything changes, everything. Growing attachments to things, places, and people is a normal part of life and so is taking comfort in what we are familiar with. Being able to let go and embrace change and let go will help to be able to move on and adapt. Positive Thinking: There has been insane amount of research done on the power of positive thought. The way a person thinks influences how they see the world. Think about it. If you are in a bad mood how does the world look? Not so good huh? Now when you are having a good day the whole world looks pretty great. When we being to be conscious about our thoughts and start changing the way we think they way the world looks and deal with our problems changes as well. Exercise: Get off the couch and away from the computer. Exercising just 15-20 minutes helps boost your metabolism and tone muscles. 30 minutes a day helps your heart and cardiovascular system. 1 hour a day helps maintain a healthy weight. Plus even just getting in a good stretch makes you feel better throughout the day and helps with that positive thinking. Find Quiet Time: Meditate, sit quietly, wait until everyone goes to bed and turn everything off and just be with yourself. Whatever it is that you need to take 10 minutes, let yourself be calm, and focus on your breath. Meditation is another scientifically proven way to improve your mental health. It’s a way to put all the craziness and bull away for a few minutes and focus on yourself. Realize Nothing Is Black And White: Nothing is every just one way. There are multiple sides to every story and everyone has their own issues that they deal with on a daily basis. Developing compassion for another person, even if it is your worst enemy is one of the most liberating things that you can do. It helps you to see another side of a situation, develop compassion, and open your mind. 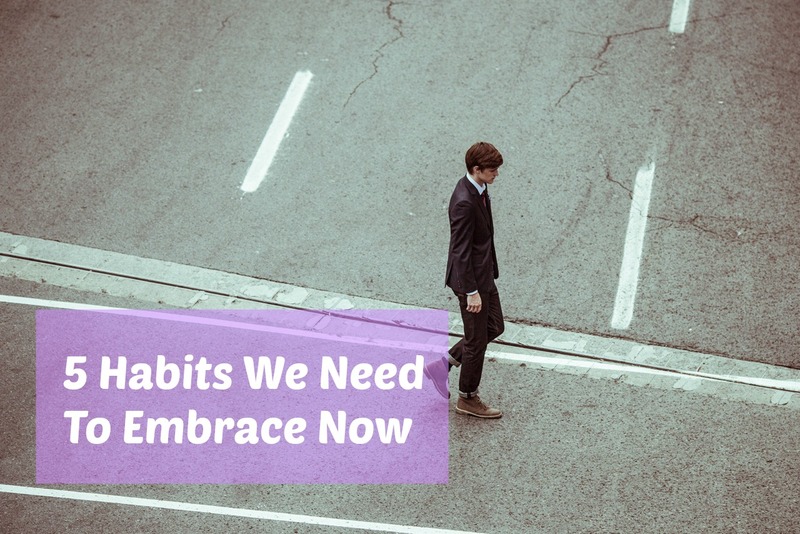 What habits do you want to embrace?